Otis Sistrunk (born September 18, 1946 in Columbus, Georgia) is a former professional football player who played seven seasons as a defensive lineman, from 1972 to 1978. He played his entire National Football League (NFL) career with the Oakland Raiders. Sistrunk later became a professional wrestler in the National Wrestling Alliance (NWA). He is a distant cousin to former NFL player Manny Sistrunk. Sistrunk was one of the few NFL players of his day to not play college football, going directly from William H. Spencer High School in Columbus, Georgia to the United States Marines. After leaving the military, the 21-year-old found work at a Milwaukee meat-packing plant and played two years of semi-pro football in the area for the West Allis Racers  before joining the Norfolk Neptunes of the Continental Football League in 1969. Sistrunk played three years for the Neptunes (the last two in the semi-pro Atlantic Coast Football League after the CPFL folded); in 1971, a Los Angeles Rams scout spotted Sistrunk and believed he could play in the NFL. During a team practice, he was observed by representatives of the Oakland Raiders, who brought Sistrunk to their team in 1972. During a Monday Night Football telecast, a television camera beamed a sideline shot of the 6'5", 265-pound Sistrunk's steaming bald head to the nation. 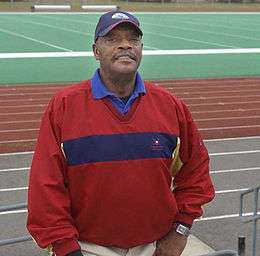 That, along with his lack of a college education resulting in the team program listing Sistrunk's academic background as "U.S. Mars" (short for U.S. Marines), prompted ABC commentator and ex-NFL player Alex Karras to suggest that the extraterrestrial-looking Sistrunk's alma mater was from the "University of Mars." Sistrunk was named to the Pro Bowl in 1974. In 1976, playing under coach John Madden, Sistrunk was part of the Raiders team that won Super Bowl XI against the Minnesota Vikings. He retired after the 1978 season, finishing his career with seven fumbles recovered and three interceptions in 98 games played. He also had a brief movie career, appearing in Car Wash (1976) and as a police officer in Alex de Renzy's "Babyface" (1977). Sistrunk had a brief wrestling career in the National Wrestling Alliance. Following the breakup of the Fabulous Freebirds, Michael Hayes was in need of a partner and teamed up with Sistrunk. Together, they defeated Jimmy Snuka and Hayes' former tag team partner Terry Gordy to win the NWA National Tag Team Championship on September 27, 1981. Sistrunk soon retired after deciding that he did not enjoy wrestling, however, and the title was vacated in late 1981. After leaving football, Sistrunk spent two years as a beer salesman. He was then approached about working with the Army as a civilian employee. He spent twelve years working at Fort Benning, Georgia. Sistrunk now manages Cowan Memorial Stadium at Joint Base Lewis-McChord, Washington and helps with athletic training programs. 1 2 3 4 5 Reinert, Bob. "Otis Sistrunk: Former NFL Star Glad to Serve Soldiers". Defend America. Retrieved 2008-01-12. 1 2 Conner, Floyd (2000). Football's Most Wanted: The Top 10 Book of the Game's Outrageous Characters, Fortunate Fumbles, and other Oddities. Brassey's. p. 9. ISBN 1-57488-309-7. ↑ "The Redskins Book: Page 94". Washington Post. 1998-02-02. Retrieved 2008-01-12. ↑ "Continental Football League: A Mini-tragedy in Five Acts". Professional Football Researchers Association. Retrieved 2008-01-12. 1 2 3 "What Happened to...Otis Sistrunk". Oakland Raiders. Archived from the original on 2007-11-05. Retrieved 2008-01-12. ↑ Rand, Jonathan (2006). 300 Pounds of Attitude: The Wildest Stories and Craziest Characters the NFL Has Ever Seen. Globe Pequot. p. 181. ISBN 1-59228-995-9. ↑ "Otis Sistrunk". Database Football. Retrieved 2008-01-12. ↑ "Otis Sistrunk Filmography". New York Times. Retrieved 2008-01-12. ↑ "Otis Sistrunk". Internet Movie Database. Retrieved 2008-01-12. 1 2 3 "NWA National Tag Team Title". Wrestling Titles. Retrieved 2008-01-12. ↑ Meltzer, Dave (2004). Tributes II: Remembering More of the World's Greatest Professional Wrestlers. Sports Publishing LLC. p. 198. ISBN 1-58261-817-8.